Rehabilitation of climate displaced persons by the government and non-government sectors are, to date, insignificant in terms of the total number of displaced persons. Importantly, livelihood problems remain after the rehabilitation of displaced persons. There should be a rights-based solution to this problem including housing, land and property rights. Therefore, there is a need to review the relevant policies and institutional frameworks identifying the protection gaps and adopting new policies to protect the climate displaced people. There should be a database for counting the number of climate displaced peoples and should have comprehensive rehabilitation programmes for all climate displaced persons. And these should be in integrated way. Speakers said at a round table discussion on climate displacement titled “Climate Displacement in Bangladesh: The Need for Urgent Housing, Land and Property Rights Solutions”. 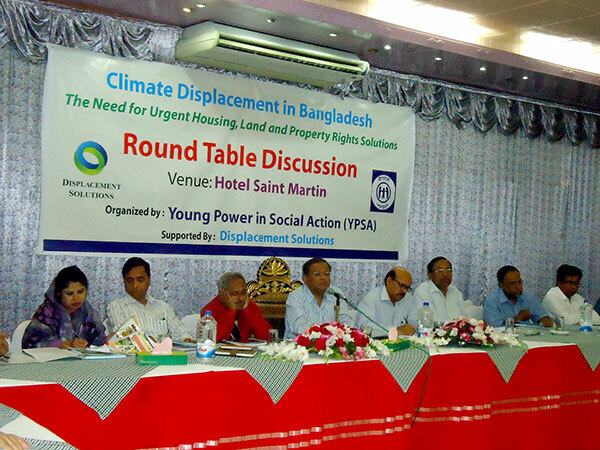 The meeting was organized by Young Power in Social Action (YPSA) on 20th March’14 at hotel Saint Martin Conference Hall of Chittagong supported by Displacement Solutions, where representative of GOs, NGOs, Journalists, academicians, researchers and local govt. participated. Dr. Hasan Mahmud, MP and former Minister, Ministry of Environment and Forest was present as a Chief Guest and Md. Jafar Alam, Director of Department of Environment, Chittagong moderated the round table discussion meeting. Mohammad Shahjahan, Team Leader of Bangladesh Housing, Land and Property Rights (HLP) Initiative presented key note paper in the round table discussion. He said, climate displacement in Bangladesh is now major concern in respect of country’s development. To face the challenge of mass displacement as a result of climate Change, Young Power in Social Action (YPSA) has been implementing Bangladesh Housing, Land and Property (HLP) rights initiative with the support of Displacement Solutions (DS) to find out rights-based solutions for climate displaced People since 2012. The main objective of this project is to identify rights-based solutions and actions that could be undertaken to resolve the displacement of these climate-affected communities as well as to ensure and safeguard their housing, land and property rights. YPSA has conducted three studies that examined in detail the true picture of land availability in Bangladesh for climate displaced persons as well as the potential durability of future resettlement. YPSA identified different Policies, Plans, Projects, Acts, Standing Orders, Strategies and Programmes of Action relevant to climate displacement in Bangladesh, which can be the basis to provide rights-based solutions to the climate displaced persons including housing, land and property rights. After the key note presentation, Dr. Monjurul Kibria, Associate Professor of Department of Zoology, Chittagong University; Abu Ahmed Abdullah, Deputy Director of Department of Social Welfare, Dr. Sairul Masreq, Professor of Department of Public Administration. Chittagong University; Engineer Delwar Hossain, President of Sachatan Nagarik Committee; Dr. Sahadat Hossain, Associate Professor, Institute of Marine Sciences and Fisheries, University of Chittagong; Dr. Amir Mohammad Nasrullah, Associate Professor of Department of Public Administration, Chittagong University; Mr. Taiful Karim, Deputy Director of Bangladesh Rural Development Board; Advocate Rehena Kabir Ranu and Monwara Begum Moni, Ward Commissioner of Chittagong City Corporation; Humayun Kabir, Lecturer, Institute of Forestry and Environmental Sciences; Adv. Anwar Hossain, Bangladesh Environmental Lawyers Association discussed among other on the key note presentation and gave valuable suggestions for ensuring the rights of climate displaced persons. The speakers emphasized that Bangladesh requires not only comprehensive policies to ensure the rights of climate displaced persons, but also a supporting institutional framework – that is rights-based, coherent and effective, with clear lines of responsibility and accountability – in order to ensure the human rights of all climate displaced persons both now and in the future in Bangladesh. Resettlement for the displaced peoples should be a last resort as climate change adaptation including ensuring the livelihood and other essential services like health, education. The climate-induced migrants are often discriminated and face different problems during or after the displacement. Chief Guest of the round table discussion, Dr. Hasan Mahmud said, climate change is happening in Bangladesh and it is the major obstacle for economic development of the country. This issue is out of politics and we should work collectively for better solution for climate change adaptation and displacement issues. This is a very nice initiative, which focuses on the rights of climate induced displaced families, Bangladesh ratifies the different UN charter and convention and even as per our existing policies we are responsible to ensure the rights of the displaced people. He agreed with the five key actions required for ensuring the rights of climate displaced persons proposed by the YPSA, these key actions are establishing monitoring mechanism; incorporation this issue into existing climate change law and policy; distribution of Government Khas land should be effective, transparent and just; Non-agricultural Khas land should be allocated for climate displaced persons; and Effective return, relocation and rehabilitation programmes should be implemented for all climate displaced persons. We should ensure sustainable utilization of land and strictly implement the land use policy and the database for climate displaced peoples should be urgently necessary, he added.